We here at Fantasy Flight Games pride ourselves on creating board games that immerse our players in a thrilling narrative by taking on the roles of interesting characters dealing with challenging situations, where every choice matters. Today's article takes this immersion one step further as guest writer Bryan Young discusses his recent trip across the pond to London and how his time there provided a new perspective on how the elements of both the city and time were cunningly portrayed in Letters From Whitechapel, the board game that pits resourceful investigators against the notorious Jack the Ripper in a deadly game of cat and mouse. 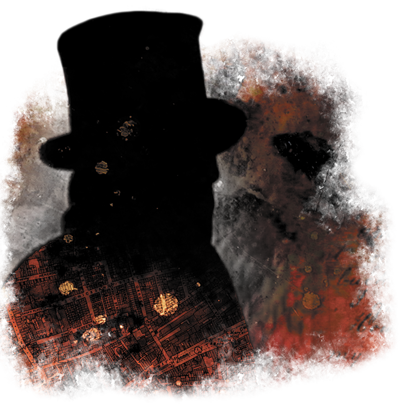 Letters From Whitechapel is a game that puts you in the middle of the hunt for the infamous serial killer, Jack the Ripper. Over the years, the case has been the subject of countless books, movies, articles, and even comic books, all of them hoping to solve the grisly murders and discover the true identity of the notorious slasher. The game is already a tense nail-biter, but if you know the context of its history, it’s even better. I’m a history nerd, so when I was in London for Star Wars™ Celebration Europe I made it a point to tour the Jack the Ripper sites to get a better sense of the history behind the murders. There were so many questions I had that I wanted answered, but, like everyone else, the biggest question on my mind had no answer at all: who was the real Jack the Ripper? In my mind, a great game has a great story, and there are few stories more fascinating than this one. One of the things that made the crime so difficult to solve was its unpredictable nature. London was a big place and there were thousands of women who fit the profile of Jack the Ripper’s preferred victim. 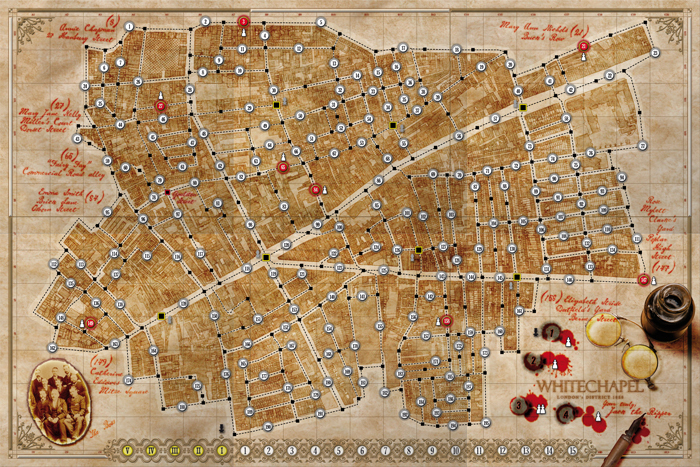 Letters From Whitechapel simulates this by spreading the potential victims and sites for their murder across the massive game board, a map of old London. The game lets you get into the shoes of both the killer and the police as you try to predict where the next murder will happen. How difficult will it be to catch him? Where will he strike next? We can only imagine what this must have felt like at the time it was happening, but the game offers a compelling simulation of that dread and uncertainty. As I toured through the Whitechapel area, I kept crossing back and forth between the different sides of the London Wall. The London Wall was the first defensive wall built by the Romans when they established the city in the 2nd or 3rd century. What I didn’t realize was that this was a natural border between two different cities: London and Greater London. Since Jack was crossing between the borders of the cities to do his killing, this meant there were two different police organizations trying to capture the killer, all without cooperating with each other. The game represents this disorganization brilliantly by putting a different player-as-police-inspector in charge of the investigation and deployment of police every round. It helps build in a kind of leaderless chaos the police must have been feeling at the time. The news made things worse by fanning the flames of distress in the community. These Whitechapel killings were obviously big news and sold papers for a long time. Journalists were so successful at sensationalizing the murder-spree that we’re still talking about it today, well over 125 years later. Imagine how high the panic in the city must have been being in the midst of it? There are people who, still today, get unsettled thinking about the grisly crime scenes and what Jack the Ripper did to those poor women. The letters, allegedly from the killer, only added to that panic, the final one delivered with a human kidney. 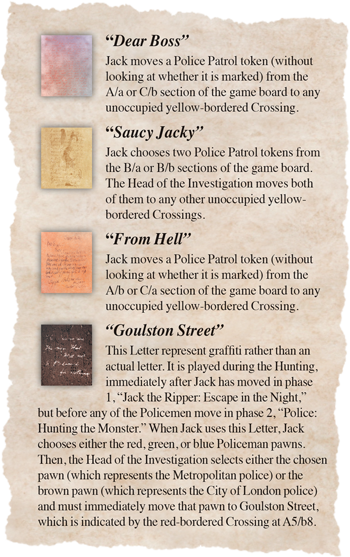 This is obviously where the game gets its name and provides a fascinating dynamic, allowing the Jack the Ripper character to misdirect the police in different ways, based on the letter being used. The game characterizes the women who were the potential victims of Jack the Ripper as “The Wretched,” but taking the tour around the city, you realize it was a lot more complicated than that. These poor souls were doing everything they could to survive. When I went on the tour of Jack the Ripper’s sites, one place I visited and was given details about were the houses where many of these women would try to spend a night to get out of the streets. Many of the prostitutes working in the area had no where to go at night—sewage was openly dumped into the street, making sleeping there nearly impossible. The cheapest option for many was to sleep sitting against the wall of a shop; the proprietor would tie a rope across the line of people sleeping there to make sure they didn’t fall over or lie down. Think about how awful that life must have been! Many of the victims were down on their luck and living in a situation they couldn’t help. Bearing this in mind certainly adds an edge of righteousness to those players who control the police investigation. Seeing the places and hearing the stories of Jack the Ripper brought a new life to my understanding of the history. Then getting to play the game after having been there added a whole new dimension to the game. 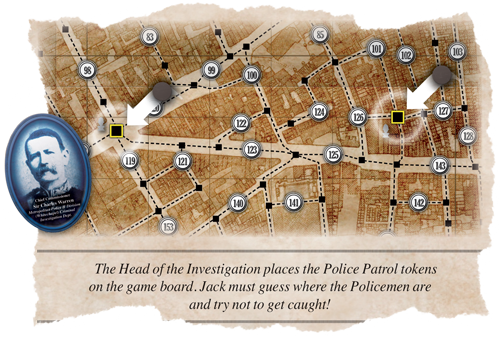 Do you have what it takes to catch Jack the Ripper before he kills again? 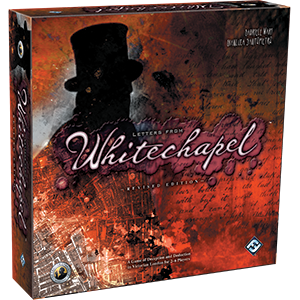 Letters From Whitechapel will put your deduction abilities to the test, accurately simulating all the challenges and trials the police and populace had to face in this dark time in history. Diving deeper into this very history makes this already great game even better. Thanks Bryan! And don't forget the upcoming release of Dear Boss, the expansion to Letters From Whitechapel that adds many modular elements that tweak and perfect your games of Jack-catching! When Bryan Young's not busy tracking the steps of history's most notorious criminals, he is a regular columnist for StarWars.com and a frequent contributor to Star Wars Insider. You can also hear him on the Full of Sith podcast and follow him on Twitter @swankmotron.